If you choose Sarsfield Memorials for your loved one’s headstone you can be rest assured that you will be involved from beginning to end. We will take you through every step of the process to ensure we meet what you tell us your needs are, not what we think they are. When you approach us we will ask if your loved one has been buried or cremated and in which cemetery. We can then advise on cemetery regulations in respect of size restrictions and if kerb sets are allowed. If you are in a 30 mile radius of us, we can visit you at home, while if you are arranging a memorial from a distance then we can communicate with you by phone, email or letter, whichever you prefer. During the initial discussions we will ask if the deceased had any specific wishes for their headstone. This allows us to talk through the pros and cons of materials and styles of lettering and also show samples to you. We will usually be able to give you a written quotation within forty eight hours, although this may be longer if the gravestone is to be custom made. This quote will be honoured unless you ask for additional work at a later date and we ask for 50% of the cost before work starts and the balance on completion, we also offer payment plans, please contact us for further information. Once the order has been agreed we will give you an estimated timescale for how long it will be before the headstone is installed. This depends on how the ground has settled since the burial, what materials need to be obtained and our own manufacturing workload. Generally though a standard design can be complete within six weeks of your order, with a bespoke one taking three to four months. You will be given a layout of how the completed memorial will look before work starts so it can be signed off and approved by both parties. When the work is complete and your gravestone is fixed on the grave in the cemetery, you have a lasting tribute to your loved one. At Sarsfield Memorials we pride ourselves in providing a personal service tailored to suit your needs. We want to be part of a process during which we hope you can find comfort once the grave is marked with the memorial of your choice. If you would like to discuss headstone options please contact us here and we will be happy to give you a free no obligation quote. The oldest family run monumental masons in Liverpool. Sarsfield Memorials has spanned three generations and next year we look forward to celebrating seventy years in business. The company was founded in 1947 by James Sarsfield and the following decade he was joined by his three sons, Tony, Bernard and Terry. The youngest son Terry served an apprenticeship in 1950’s as a stonemason in Carrara in Italy and Sarsfield still has business relationships with the quarries there. James Sarsfield passed away in 1968 and the three brothers continued the business until Tony left in 1980 and Bernard retired in 1990. Terry then ran the company until his daughter Ursula joined the business in 1997, but he remained involved and retired completely in 2007 at the age of 75. Ursula can remember as a young girl spending many a Sunday afternoon visiting cemeteries with her father as he costed jobs. Today she prides herself in dealing with all customers personally and offering a bespoke service that allows people to have a perfect lasting symbol of remembrance for their loved one. In addition to the traditional family headstones, Sarsfield has also carried out many commissions for the Catholic Archdiocese of Liverpool, including the supply and fixing of altars. The first altar Sarsfield supplied was at the new church of St Swithin’s in Gillmoss in 1959, where Terry got married in October that year, the first nuptial mass to take place there. Unfortunately the church closed in 2004 but Terry and May are still going strong and this year they celebrate 57 years married. One of the most high profile commissions was in 1996 when we supplied and fixed the black slate tomb at the final resting place of Derek Worlock, who was Archbishop of Liverpool from 1976 until his death in 1996. The tomb is situated in the Chapel of St John at Liverpool’s Metropolitan Cathedral of Christ the King. We have also supplied the lectern for this cathedral, which has been made out of one solid piece of curved marble. for which we have also supplied the marble lectern. We have also worked on the Martins Bank building in Water Street and the Princes Road Synagogue along with many other listed buildings in the Liverpool area. Although Ursula now manages the business Terry continues to be involved in stonemasonry despite being in his eighties. He is an honorary member and past president of the National Association of Monumental Masons (NAMM) and provides consultancy on all aspects of the industry to masons both at home and abroad. He is also the UK agent for Incimar who supply lettering equipment to the trade. 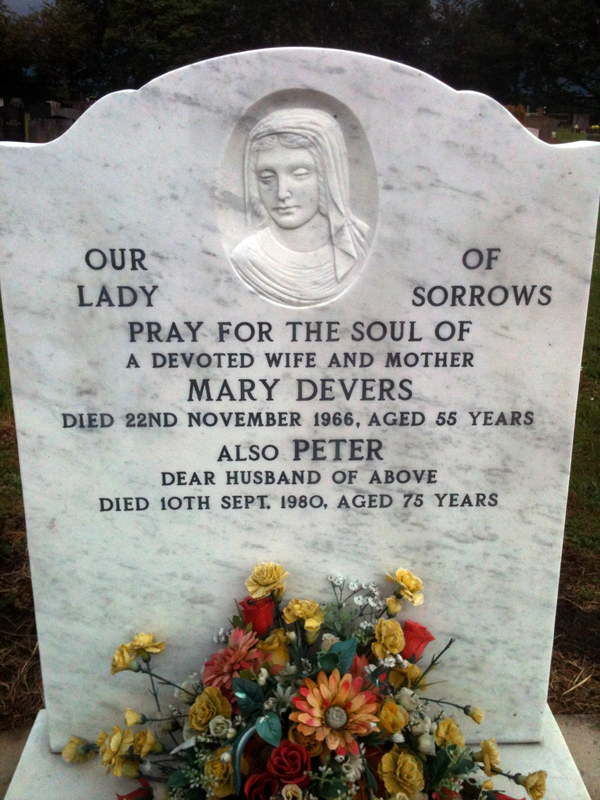 Mother’s Day is a time of year when you may be thinking of updating the headstone of your mum’s grave. It may be that you want to add an inscription or verse to an existing gravestone or get a new memorial, either replacing what is currently there or erecting one at a new grave. It may be that you wish to come up with your own verse for your mother’s memorial, just be aware that the more words there are, the smaller the lettering is and they may be harder to read. The style is important too, as some fonts have to be cut deeper into the headstone and will differ in final appearance depending on the material. If you contact us we will be able to discuss the options for you depending on the material of your existing headstone or a new one that you may choose. Whether it be adding to new headstones, existing ones or replicating the original lettering, inscriptions can be added to gravestones in lead, enamel or gold-leaf. The style can be raised lead lettering, cut and leaded, v-cut, incised or sand blasted. We use traditional hand cut techniques using a hammer and chisel, but also sandblasting and the ultra modern CNC (Computer Numerical Control) method. If you are thinking of adding or replacing a headstone at a grave, do bear in mind that if your mother is recently departed, then there is a period of around six months where the ground is allowed to settle before it can be installed. If she is being laid to rest in a family plot the existing gravestone needs to be removed and either a new one placed there or an inscription added to the existing one. In either case, the ground again needs the time to re-settle. It is not advisable to simply leave the headstone lying flat on the ground as this makes it prone to weathering and resultant damaged lettering, or even worse accidental damage or mindless vandalism. At Sarsfield Memorials though we will store your memorial for you free of charge in optimum conditions until the ground is ready for it to be re-installed. If you have an enquiry regarding a headstone for a new grave, replacing an existing one or adding an inscription, please contact us and we will be happy to provide a free no obligation quote.